Total fusion 10 pocket billiard table. This listing is for one of the most unique/ rare billiard tables you will ever play on. What we have for sale is a total fusion 10 pocket billiard table yes, the id tag says eight pocket right angle! But the fact is that the manufacture never made id tags for the total fusion and just reused the right angle tags which adds to its. The table is used and will need some love and care to bring you back to the 90’s. A beautiful table that has some minor cosmetic damage on the legs however is playable. On what your definition of playable is see felt pictures. And really just needs to be shined up. We never played on this table so i cannot say how the ball retrieve works, i did put a couple balls down the pockets and they all came back through the ball return. For the last 15 years it has been in covered deep storage only taking it out to sell here. It does have a place for a coin slot, making it functional for home or business. The table was made at the. Northfield cabinet shop located in conover, wisconsin. 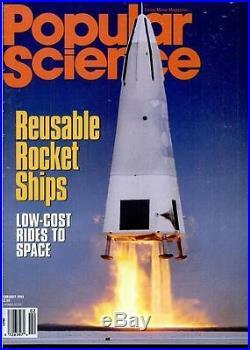 And was featured in the february 1994 issue of popular science. The table is quite large and will need a lot of space. Approximate dimensions of the table are 112? Please see pictures for the best. Of what you will purchasing a picture is worth a thousand words!! I have many more. And upon request can send additional ones. We would prefer local pick-up, and will. Reduce the price for this convenience! Please make an offer, we will only respond to serious inquiries. 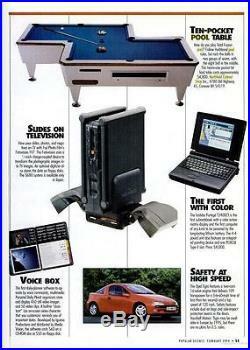 This is what i could find online that describes the table from back in the 90’s a great vintage piece! The top is all one piece and the table separates in the middle. All tables are made of solid oak or birch hardwoods and veneers. 5×2 inch rails of oak or birch enhance ball impact resistance and assure excellent play. Solid wood gulley system is hand-tuned to perfection. Northfield cabinet shops exclusive ball trap design is simple, efficient, and dependable. Excellent playing surface with precise roll is assured by northfield cabinet shops exclusive one-piece, 1 5/8 inch thick, 340 pound top. Great to handle and easy to recover. Playing surface is supported by maple cross members posted to 3/4 inch bottom. Accurately constructed total fusion box ensures easy leveling and perfect play. All tables are numbered and plated as tables remain very limited (this table is number 13). All total fusion tables are available with “kd” or knock-down feature that enables easy entry into all passages. Units can be picked up, uncrated, located in temple pa (outside of reading pa). We do not charge for local pick-ups! The equipment is not cancelable or returnable. 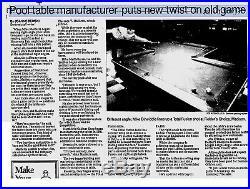 The above item will specify, in the description, whether the unit was tested, along with descriptions of any cosmetic damage to merchandise.The item “10 Pocket Billiard Table (Pool Table) Extremely Rare! Northfield Cabinet Shop” is in sale since Tuesday, May 05, 2015. This item is in the category “Collectibles\Advertising\Merchandise & Memorabilia\Store Displays”. The seller is “basilbee” and is located in Temple, Pennsylvania. This item can be shipped to United States.